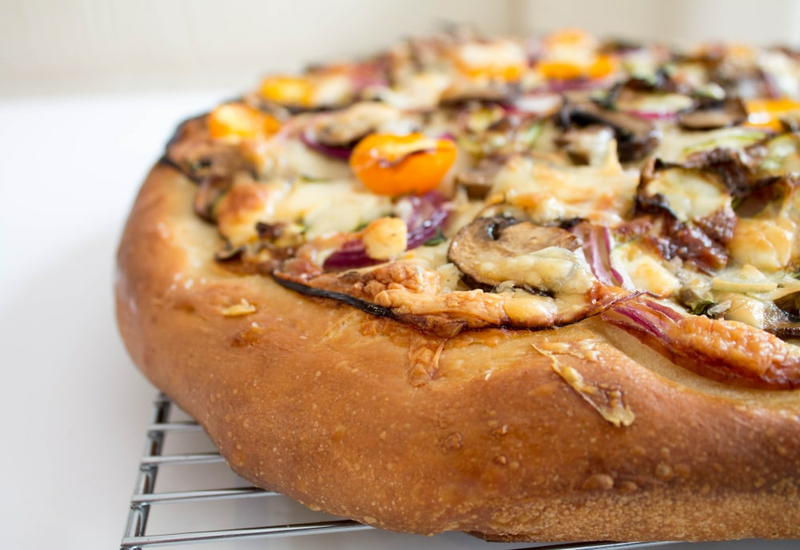 Pillowy focaccia bread gets topped with cremini mushrooms, juicy tomatoes, healthy zucchini, with a hint of onions and herbs, transforming this traditional bread into a deconstructed grown up version of pizza. Make your dough ahead of time and store it in the freezer. When ready to use, thaw out at room temperature for about 4 hours. Per Serving: 316 calories; 8g fat; 52.1g carbohydrates; 9g protein; 5mg cholesterol; 743mg sodium. The crust alone on this focaccia deserves five stars. So good! The mushrooms give it such an aromatic flavor, I love it. I recently made this recipe and what I love is how the onions and herbs blended perfectly in this cheesy focaccia. This is a great dish for date night or happy hour.